Kashmir: Oodampore, 4 Marches from Jummoo. 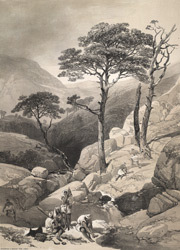 bl.uk > Online Gallery Home	> Online exhibitions	> Asia, Pacific and Africa Collections	> Kashmir: Oodampore, 4 Marches from Jummoo. Plate 5 from "Recollections of India. Part 2. Kashmir and the Alpine Punjab" by James Duffield Harding (1797-1863) after Charles Stewart Hardinge (1822-1894), the eldest son of the first Viscount Hardinge, the Governor General. This represents a view of Oodampore.Within 18 months of Henry Hardinge's arrival in India as Governor-General, the First Anglo-Sikh War broke out in December 1845. Hardinge and his son, Charles travelled in this region and Charles wrote, "At Oodampore we encamped in a wood with some old buildings near it, and a rocky stream running close under our tents." The cavalrymen in the foreground are soldiers of Gulab Singh, an ally of the British.